Statue at Versailles, Paris depicting an angel and wreath against a deep blue sky. Versailles is an amazing place. The lavish palace, much of it functioning as a museum, and grand, structured garden can easily keep you busy for a full day. I particularly liked the hard-edged starkness of the above statue and how that contrasted with the smoothness of the blue sky and the more whimsical nature of the surrounding clouds. The warm/cool color contrast further adds to the separation between statue and sky and, in a way, helps to both visually and metaphorically ground the statue. One possible reading that might follow is that the angel is now earth-bound. And what about the relevance of the statue's gaze towards the wreath? What might this suggest? 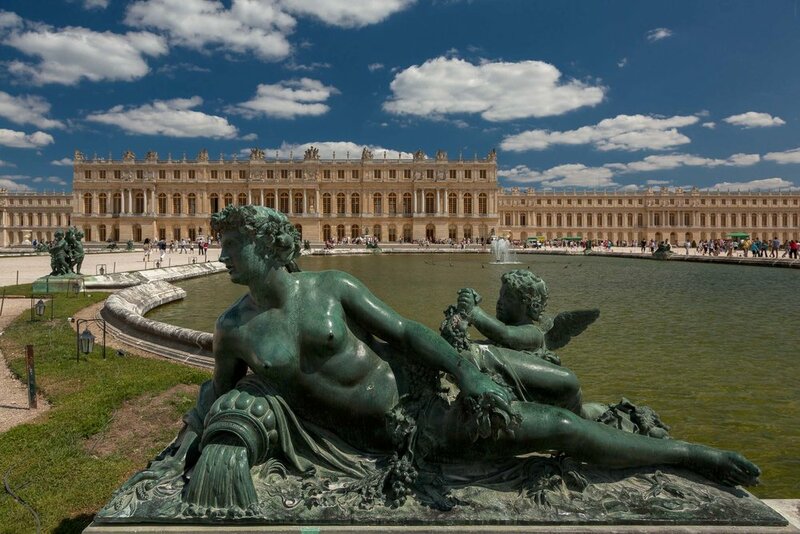 My visit to Versailles was on a very warm summer's day during peak tourist season. I can tell you that the heat and the crowds made photography difficult and, by the end of the day, I felt like I’d really earned my photos. The queue, just to get into the joint, was long and slow moving. After about 45 minutes I got through the gate and made the mistake of following the crowd towards the museum section of the palace. Once in the door I was immediately herded up the stairs where the crowd moved me, very slowly, along the long corridor to view the wonderful art on display. 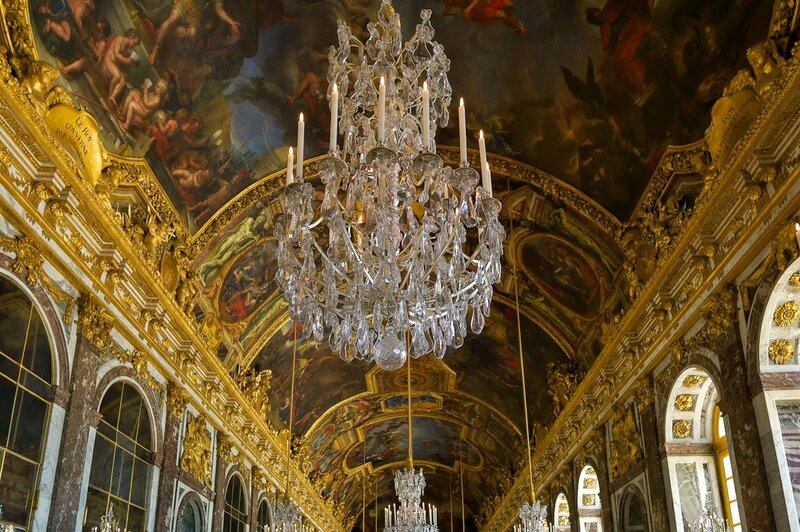 A magnificent chandelier against a famously ornate series of ceiling murals at the Palace of Versailles, France. I made a few photos along the way, but it was tough. There were just so many people to contend with. In desperation I pointed my camera up towards the ceiling to avoid having any people in the photo. 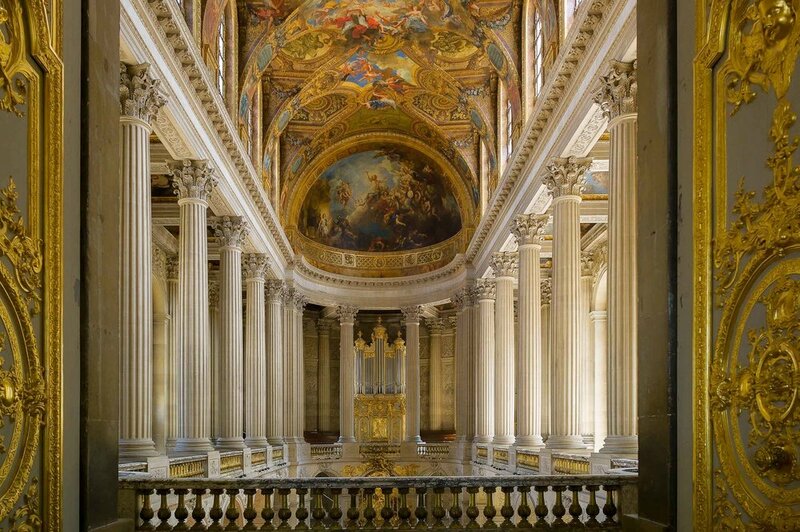 An interior view of the spectacular Palace of Versailles, France. I was very happy to make the interior image directly above. I waited for a good 10 minutes until the scene was empty of people, during which time I made my camera ready to make the photo. I’d say there was about a 3 second window of opportunity during which time I made the above image. After that a whole new stream of tourists poured past me and into the space. I made a few more photos amongst the madness until, just when I thought I was done for, I found an exit door and got the heck out of there. One day I'II return, out of season, and experience the palace in relative peace and quiet. Statue, depicted in a state of repose, in the grounds of Versailles, France. Once outside I checked out the main fountains, along with hundreds of other people. They’re very nice, but the crowds and the very bright light made making interesting images difficult. 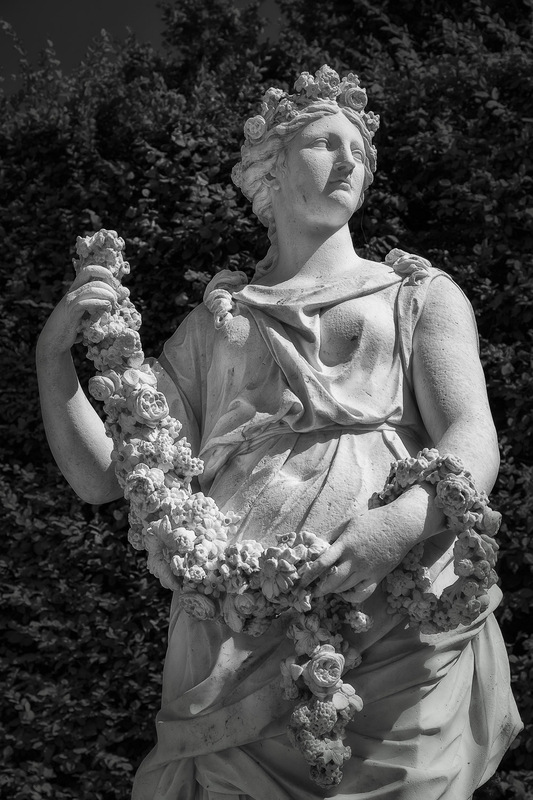 Statue and wreath in the grounds of the Palace of Versailles, France. Fortunately, after walking for a few minutes, I was able to lose myself along the myriad of pathways snaking through the huge green gardens in front of the palace. By doing so I was able to find lots of nooks and crannies, far enough away from other tourists, where I was able to make photos in peace. A statue depicting King Louis XIV, the Sun King, at the Palace of Versailles, France. Of course meaning does not exist solely with the artist or the patron commissioning such artwork. It also exists with the viewer and, in the case of public art that’s been re-purposed through photography, new interpretations are also possible. By photographing the statues in this post my own artistic concerns are also part of the final image. As always I hope to influence the viewer towards a deeper interpretation of what they perceive in my photos and in the world around them. I've long been captivated by statues, religious or otherwise. Other than the quality of craftsmanship I think I'm particularly drawn to the metaphor and symbolism that’s often explored in statues. The most compelling statues seem to be embedded with human drama and emotion. Are You A Picture Maker Or A Picture Taker? As I write it occurs to me that, like a photograph, a statue represents a moment in time. And, just like a photograph, a statue presents a kind of reality. One that has been created be the maker. Photographers, as creative beings, are makers too. It might be worthwhile asking yourself whether the photos you make are part of a much larger process of creation. Are you adding to our world and our understanding of it through the photos you make or are your photos more about taking something from the world for yourself? Words are important. Words have power. And I’m not at all happy with the frequency with which most folks use the words take, capture and shoot in relation to the photos they make. Every time I use the words make or create I’m reminded of the positive, life-affirming nature of my photos and the way I approach my photography.